To Mark the 18th Barsi of Pt. Amarnath Miturang Festival: Mohan Veena Recital by Pt. Vishwa Mohan Bhatt. 07.45 PM. Venue: India International Centre, 40, Max Muller Marg, Lodhi Estate, Delhi. To Mark the 18th Barsi of Pt. Amarnath Miturang Festival: Vocal Recital By Bindu Chawla. 06.15 PM. Venue: India International Centre, 40, Max Muller Marg, Lodhi Estate, Delhi. Hindustani Classical Vocal Recital by Mandar Gadgil, disciple of Pt.Vijay Koparkar. Accompanists- Ajay Kumar (Tabla), Shyama Kumar Bharati (Harmonium). 07.00 PM. Venue: India Habitat Centre, Lodhi Road, Delhi. Shubha Mudgal (born 1959) is a well-known Indian singer of Hindustani classical music, Khayal, Thumri, Dadra, and popular Indian Pop music. Enjoy her vocal recital @ 06.30 PM. Venue: Chowdiah Memorial Hall, Gayatri Devi Park Extension, 16th Cross, Malleswaram, Vyalikaval, Bangalore. Hindustani Light Classical Vocal by Shamma-E-Ghazal. Artist: Runa Rizvi - Neha Rizvi. Special Appearance: Rajkumar Rizvi, Indrani Rizvi(Guldusta of Ghazals, Nazams & Sufi Kalaams) Co-ordinated by: Lalit Varma. 06.30 PM. Venue: Bhavan's Cultural Centre, Bhavan's College, Munshi Nagar, Andheri (West), Mumbai. Maharashtra Cultural Centre presents “Adi Dev Mahadev” - a special concert of Bandishes depicting Lord Shiva from the repertoire of BhendiBazar Gharana on the occasion of MahaShivaratri Singers: Dr. Suhasini Koratkar and Shripad Bhave Accompaniment: Chaitanya Kunte (Harmonium) & Arun Gawai (Tabla) Compere: Rajashree Mahajani. 06.00 PM. Venue: Sudarshan Rangamanch, Near Ahilya Devi High School, Pune. Indian Council for Cultural Relations (I.C.C.R.) will be presenting Hindustani Music(Vocal) by Mrs. Gayatri Pramod Tonapi, Bengaluru under the Every Friday Cultural Evening Programme. 06.00 PM. Venue: Yavanika State Youth Centre,State Youth Centre, Nrupatunga Road, Bangalore. Hindustani Vocal Recital by Nirmalya Dey, recipient of the Sanskriti - Pt. Vasant Thakar Memorial Fellowship 2014. 06.30 PM. Venue: India International Centre, 40, Max Muller Marg, Lodhi Estate, Delhi. Sangam Mandir Golden Jubilee celebration: Tabla recital by Prithviraj Mishra, Hindustani Instrumental - Mohan Veena by Pandit Vishwa Mohan Bhatt. 05.30 PM. Venue: Azad Bhavan, ICCR, Indraprastha Estate, Delhi. Hindustani Music - Sarod Recital by Pramantha Mohun Tagore from Kolkata, disciple of Pt. Kamal Mullik. 04.30 PM. Venue: India International Centre, 40, Max Muller Marg, Lodhi Estate, Delhi. Sarangi recital by Ustad Kamal Sabri Followed by Hindustani Vocal recital by Ustad Laxman Das Sandhu. Collab: Baba Vishwanath Society for Music and Performing Arts. 07.00 PM. Venue: India Habitat Centre, Lodhi Road, Delhi. Hindustani Classical Vocal recital by Nath brothers- Pt.Vishwanath & Pt.Ramnath Followed by Flute recital by Pt.Rajendra Prasanna. Collab: Baba Vishwanath Society for Music and Performing Arts. 07.00 PM. Venue: India Habitat Centre, Lodhi Road, Delhi. Shubra Guha (Vocal) & Pt. Jasraj (Vocal). Shriram Shankar Lal Music Festival 2014 - Day 4. 11:00 am: Shubra Guha (Vocal) 7:00 pm: Pt. Jasraj (Vocal). Venue: Kamani Auditorium, # 1, Copernicus Marg, Mandi House, Delhi. Shriram Shankar Lal Music Festival 2014 - Day 3. B.R. Chowdhary (Sarod) Venkatesh Kumar (Vocal). 07.00 PM. Venue: Kamani Auditorium, # 1, Copernicus Marg, Mandi House, Delhi. Shriram Shankar Lal Music Festival 2014 - Day 2. 1. 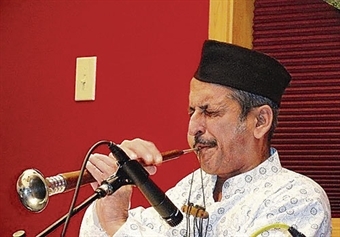 Rakesh Chaurasia (Flute) 2. Pt. Rajan Sajan Mishra (Vocal). 07.00 PM. Venue: Kamani Auditorium, # 1, Copernicus Marg, Mandi House, Delhi. Shriram Shankar Lal Music Festival 2014 - Day 1. 1. Sujaat Hussain Khan (Sitar) 2. Ulhas Khasalkar (Vocal) . 07.00 PM. Venue: Kamani Auditorium, # 1, Copernicus Marg, Mandi House, Delhi. IHC Music Concert. Sarod recital by Ustad Amjad Ali Khan Accompanists: Anubrata Chatterjee & Mithilesh Kumar Jha (Tabla). 10.00 AM. Venue: India Habitat Centre, Lodhi Road, Delhi. Gunidas Sangeet Sammelan' 1. Satish Vyas (Santoor) 2. Rajan & Sajan Mishra (Vocal) By Maharashtra Lalit Kala Nidhi. 06.00 PM. Venue: Kamani Auditorium, # 1, Copernicus Marg, Mandi House, Delhi. Gunidas Sangeet Sammelan' 1. Gaurav Mazumdar (Sitar) 2. Madhup Mudgal (Vocal) By Maharashtra Lalit Kala Nidhi. 06.00 PM. Venue: Kamani Auditorium, # 1, Copernicus Marg, Mandi House, Delhi. Pandit Vidur Mallick Dhrupad Samaroh Hindustani Vocal recital by Priyanka Mallick. Followed by Dhrupad recitals by Brij Bhushan Goswami, Pt.Prem Kumar Mallick & Samit Mallick. 07.00 PM. Venue: India Habitat Centre, Lodhi Road, Delhi.